Thanks to my amazing colleague, D. Allison Lee and her Organize to Revitalize blog. Here are some practical ways to make a difference for your ADD family. In memory of my high school choir director, Andy Housholder. Not many families still have vinyl records. Not many have turn tables to play these on. 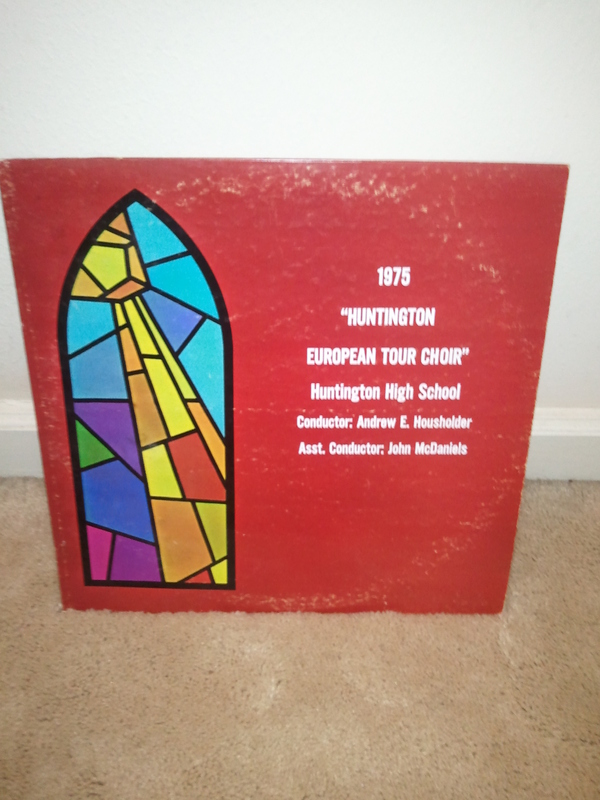 But I am blessed to have both, and especially to be able to listen to this special album recorded in 1975. This is what I call a precious keepsake. It brings back memories of community, commitment, affirmation, exhilaration, determination and connection. Music does this for all of us. Music moves us. It takes us to places and memories, both in the present and the past. We are transported back to other times in our lives. But for me this is truly something I hold dear, my high school choir, the people who were in choir with me, and the affirmation from our director. Mr. Housholder brought out the best in all of us, through hard work, time spent together, and personal dedication. It is a lifelong lesson that I learned. I learned that my commitment can mean more than my skill set. Ask for excellence and experience an amazing result. Work together as a team and experience a result that is far beyond one person’s effort. The spirit of the music brings back all these memories, as well as affirms me in all that I do now. So is it is pitch (toss) or pitch (keeping in tune)? For me, it will be tuning up my life, for a long, long time. Searching for a new way to organize, with not only function but also beauty and style? As a member of NAPO I am fortunate to preview Rubbermaid’s New Bento Boxes! This new concept for stylish organizing makes a difference in lots of spaces. Bento’s Flex Dividers allow users to customize the inside of the box, creating organization solutions that are perfect for a variety of needs. Flex Dividers pop open when needed, and simply pop back when not. Each Flex Divider can be opened or closed separately of the others to create a permanent home for belongings. Bento Toppers™ can be used in two distinctive ways. One way is that it can be a tray to display and contain items. By using Bento Toppers this way, you can create boundaries for items that can often take over a counter space such as magazines or mail. Use the Bento Topper on its own, or resting as a tray on top of a Bento Box to contain items like remotes while cov-ering the contents in the box below. The second way to use Bento Toppers is as a lid for the Bento Box by simply flipping over the Topper. This way you can hide things (such as personal bathroom items) that you do not want everyone to see but are needed for easy access. Bento Boxes and Toppers come in variety of fabric designs and colors to compliment any home décor. The boxes were designed to hold common household items such as DVD & Video Games, File Folders, Mail, Toys, Hair Care Accessories, Audio & Video Accessories, Magazines, Board Games, Crafting Supplies and Office Supplies. Bento Boxes are stackable to make the most out of your space. Covered with polyester, the boxes are durable, yet easy to clean with a damp cloth. Bento boxes are available at Rubbermaid.com, Fred Meyer and Macys.com. They range from $8.99 to $27.99 in price. This makes them an affordable stylish product! Thanks to Rubbermaid, I received a set of Bento boxes in red. These are already storing art supplies and toys in my home! Want to win a Bento Box? Leave your comment on how you will use this fabulous new product in your home! Contest ends on October 20! I did a random drawing, entering all the names and the winner of this fabulous set of boxes is Kitty! Thanks to everyone for sharing their ideas! I love sharing success stories! It takes courage, tenacity and a team to make a big change from a home filled to the brim to a home ready to sell. I am fortunate to share Audrey’s story! Audrey and I started working together in 2007. We met in her home to get started organizing. It was a meeting that stayed on my mind, a professional and proper woman who had a home filled to the brim. Audrey was recently diagnosed with ADD, had become a member of our local ADD chapter and knew of her challenges all too well. She was just at a beginning stage of recognizing what was ahead of her. Audrey was still in denial about the challenges she faced. About two years went by, and Audrey contact me again to help her. At this time, she had recently purchased a new home and wanted to sell her hoarded home. It was troubling to her, but in a compelling way. It was difficult to part with items in her old home, even though the new home was fully furnished. She shared that at her new home, she had wished to build a shed that was hold all her belongings. It would have walls and walls of shelving, just to keep her stuff. However, with the economy and her husband’s poor health, their new home would not include this shed. It was beginning to dawn on her that her belongings would not fit in her new home. She was beginning to part with her stuff, but it was still very difficult. A year later, in 2010, Audrey was in touch again. This time Audrey knew it was time to make a serious change. She must sell the old home and dispose of the contents. Together we applied to a number of television shows to get her help. She was willing to tell her story in exchange for the assistance provided. We were declined by all the shows. It was in being declined that Audrey realized she must build her own team. She invited church members over to help her declutter and move items. She hired a mover who also took off items and donated or sold them. Audrey paid college students to help her. She was making great progress. This week Audrey invited me to see her success! I am thrilled for this transformation for her. What did she share that made this success happen? Her husband and daughter Lisa supported her in this work of decluttering. They would go with her to the home and be there as a sounding board. She had the support of her therapist in working through grief issues that had been reasons behind holding on to some of the items. Her realtor said to her, “What could be of such great value in this home that you are paying monthly for the utilities and more?” Audrey realized that the $200 she pays monthly for electricity is an unnecessary expense. Me! Audrey would check in for accountability regularly, just to share with me her progress. Audrey realized that this home and its stuff was a barrier in her relationships and had held her back long enough. What did Audrey uncover that was most valuable to her? Jewelry and a bible belonging to her brother. What was the hardest thing to let go of? Her grandson’s papers from elementary school and anything belonging to her mother. What did she do with the items? Mainly donate, but also throw away a lot of it. I am attaching a gallery of shots from Audrey’s home. Each before picture is taken from the hallway. In the first picture, you can’t get in the room, it is just a view of plastic bags. Each room has enormous items to tackle. Audrey is courageously sharing this success and her story. Thank you Audrey for partnering with me to make a difference! Our cars need organizing too! It’s scary when we need to give someone a ride and they might see the inside of our car. In the fall we start back on our regular routines of school and work. In the summer you are traveling and spending time with your kids in the car. Your car is your office on the go and your home away from home! Whether you are a professional going to work or a busy mom or dad carpooling, having an organized vehicle can make the difference in your travels. Organizing your car takes a few extra minutes that are well spent! 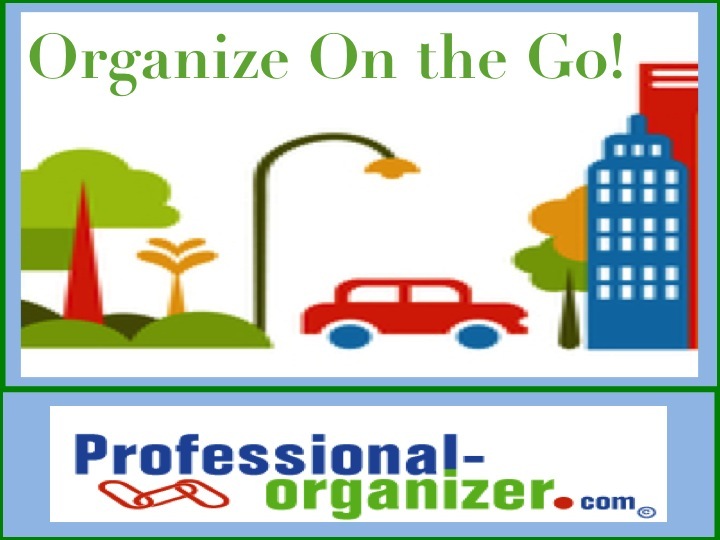 If you car is your mobile office, organize for stocking, storing and traveling with business tools. Carry some basic desk items such as business cards, calculator, stapler, scissors and tape in a zipper case or small tackle box. Store files in a hanging file case with a cover. For kids on the go, being organized makes every trip more fun. Place an organizer in the back seat or over the seat with a place for a water bottles, electronic games and books. For movies and technology, add a CD holder on the visor. Place a basket with small fun “just in the car” games and puzzles to keep them entertained. Every day items require storage too. The leak proof trunk organizer keeps all sorts of items from milk to soccer balls from rolling around your trunk. For tools, purchase a durable canvas bag to contain all the tools including jumper cables. A pop up trash can made of durable mesh can fit by the driver’s seat. The glove compartment or center console is a great spot for this! Use a check organizer and group the papers by category, such as maps and directions, insurance, warranty/instructions and emergency phone numbers. Be sure to label each pocket for easy retrieval. Finally, keeping your car organized requires maintenance routines. Each time you stop for gas, empty the trash. Restock the items for your business on a weekly basis. Assign the responsibility of vacuuming your car regularly to one of your children or have your car cleaned monthly at the big car wash.
Be vigilant about your registration sticker and use a reminder on your paper or tech calendar. You can also use this to remember when to change your oil or rotate tires. 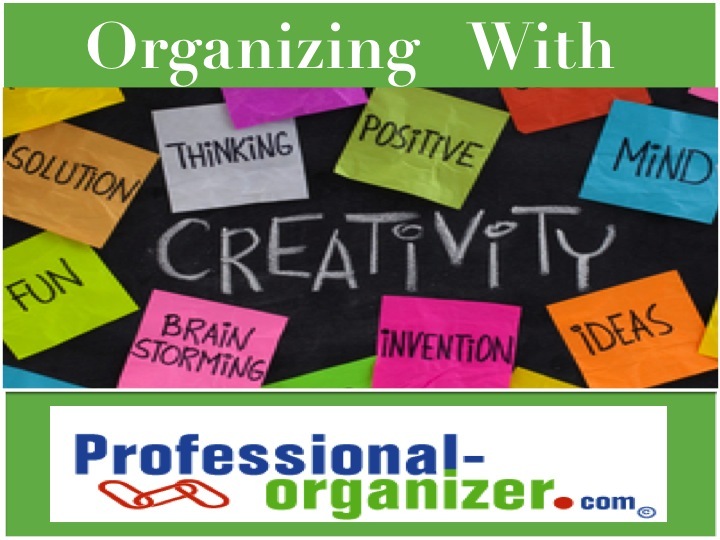 Many times we think organizing and creativity do not work well together! Organizing is thought of as logical and sequential, lacking emotion, but big on function. This is not always the case! Organizing and creativity work together in bringing out the best for promoting creativity. Use your space best to promote your creativity in these ways. Create easy access to the items you use most. If you are an artist, you want to have a space to accommodate the medium you love most, with secondary storage for less used mediums. If you are a writer, you want access to your computer, laptop or ipad, with as little clutter as possible in the space it is used in. If you are a crafter, then think about using vertical space in your designated room. Create time to enjoy your creativity. Often we don’t allow ourselves time to spend in what we love most. Be sure to include a time each week set aside just for creativity. This may seem less than spontaneous. However, my artist clients find that having a time to paint gives them the opportunity rather than miss painting all together. Also allow yourself a large block of time for your creativity. It may take a few minutes to get started, but once started you want to have time to enjoy! Create time to set up systems that work for you with your organizing. If you prefer visually appealing spaces with lots of visually organized items, using wall space makes a difference. You can see “it”, whatever the tools or items may be, so you incorporate that into the work itself. Take time to decide how you will use your items. Will they be stored in units by craft? Or will they all be used together? It can be a work in progress as you use your items, but create an awareness so you can refine your systems later. Create a space that will fill you with promise and fun! Your space should be a color you love, with music to inspire, lots of light and great spaces to work on. After this, think about rolling carts, rolling tables, rolling chairs and movement to assist with your creativity. Use a picture to inspire you! Organizing for your personality and your creativity will make the most of your time and space.